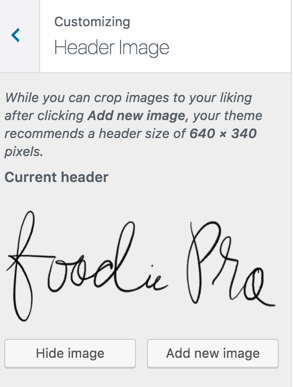 How to Add a Logo to Foodie Pro 3.0 - Feast Design Co.
To display a logo in your header instead of your site title, navigate to Appearance > Customize and find the Header Image option in the customizer to upload your logo, which should be roughly 320 x 100 pixels. In the past, we recommend “retina logos”, which was an image at double the pixels you wanted it to display at. As the web has changed, it’s become more important to have images that are small and therefore download quicker, and optimized for mobile, which are generally much smaller screen sizes. Mobile makes up roughly 80% of pageviews for most food blogs, and this makes sense, because people often search for recipes on their downtime, or while at the grocery store. A good chunk of traffic for food blog often comes from Pinterest, which people tend to use disproportionately on their mobile devices. Finally, mobile devices aren’t always connected to wifi, which means they’re running on a slower mobile connection, which is metered (you only typically have a few GB of monthly bandwidth). Small images are essential for pagespeed purposes. All these factors combined means that it’s far more important to have a small header than it is to have a pixel-perfect “retina” logo on desktop. The oversized headers of food blogs of 2016 are gone. Modern logos are are small so that they respect the devices your visitors use, and unobtrusive, so that they don’t take up valuable above-the-fold screen real estate.